The first steps include raising awareness – of sustainable tourism concepts by key leaders and stakeholders, and of the current situation at your destination. We recommend training and conducting some form of evaluation or assessment of the destination’s current practices. To manage for continuous improvement – we strongly recommend compliance to Criterion A2 of the GSTC Destination Criteria, the creation of a multi-sector group that ensures sustainability is inherent in all practices of the public and private sectors at the destination. GSTC Destination Assessments – conducted by GSTC’s own internal expert assessors. 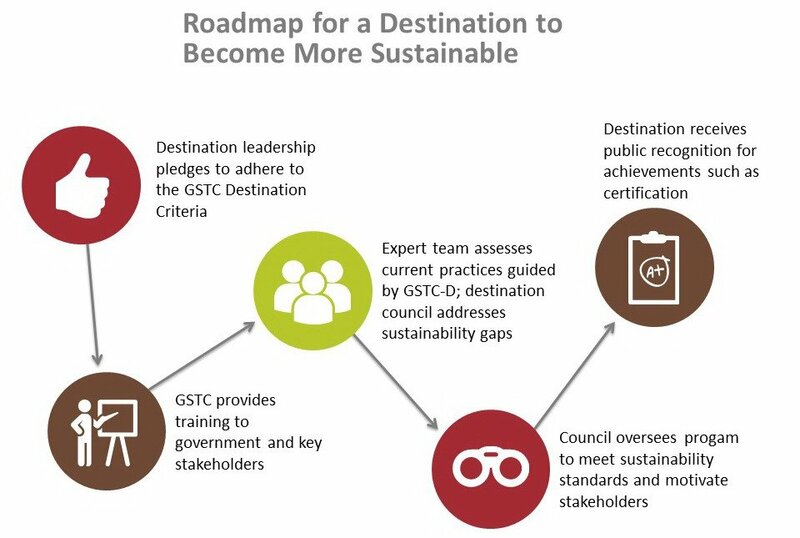 An assessment is made of how well your policies and practices adhere to the GSTC Destination Criteria, a useful tool for understanding how sustainable are your current practices and learning where to improve and where to maintain good practice. GSTC Assessors utilize the GSTC Destination Criteria. GSTC Accredited Certification Bodies can also conduct assessments based on their GSTC-Recognized standards. Destinations that are considering sustainable certification in the future may wish to engage directly with one of those organizations (note that GSTC does not directly certify; rather we accredit those that do).